It's Australian Guineas Day at Flemington with a decent support card, ahead of next week's Super Saturday programme. Analysing the stayers' race for the blog are the seasoned professionals from Premium Racing Services, providing the first of several previews for the weekend. Race 5, 3:10PM local, 0410 GMT. The pace looks to be ok without it being too genuine with Zadon and Tuscan Fire expected to be the on pace runners. Unsure who will take the lead outright, could be a surprise runner with a change of tactics which is hopefully notified by the stewards pre-race. You Think So also has the potential to push forward like he did last start, but they went at an extremely slow tempo which rated well below the benchmark. Martinvast has also in the past push forward with some successful, including here four runs back. 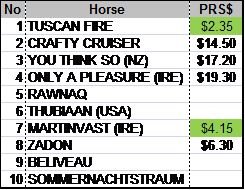 This market is of our system's ‘raw’ prices which is set to 100% with every runner rated >$21 eliminated. Our clients get a market <100% on a wagering sheet which also blends in the public price of each runner to find a wagering edge. Produced another good effort last start behind good galloper Taiyoo who has defeated him in last three starts. That galloper is the early Adelaide Cup favourite on Monday. Was defeated four runs back here by You Think So but did race keenly and close well late to the line on an unsuitable tempo. Looks to be in excellent form that only a three-four of the gallopers are in. Also receives a good map on the pace with their only one other runner likely wanting to do so. With only a 1kg weight rise from last start he is only require to produce a similar rating to recent starts to be the one to beat. Clearly a backable overlay on the early price. Went well to line last week when back to 2000m after over racing early. Was preferable to be much closer to the speed to threaten that time of the day. Sharpens him up to coming up in trip again on the back up. Receives a small jockey bonus with Dwayne Dunn back on who rode in previous two starts, including two runs ago when racing keenly again on a very slow tempo, which is a disaster but he was still good enough to finish only a half length off the winner. Been a long campaign and hasn’t won since August 2013 but receives his best chance to win for 12 months on our predicted ratings. Had all favours on a crawling speed last start and was just beaten on the line. Race was run over 15L slower than the benchmark. Very inconsistent type that is capable of finding little luck, a poor attribute to have. Seems to rate superior when settle within 4L of the leader as proven with win here three runs back. Every time he has produced a new PB or near it he has crashed at his next start. That is expected here and as our rated price shows we are prepared to work around him. Is expected to keep drifting. We will be recommending our clients to use our staking software to back the early overlays TUSCAN FIRE & MARTINVAST race morning.